The play The Crucible, was written by Arthur Miller in 1953, during a period of tension and fear. Driven by desperation and determination to show the light to readers, The Crucible was Miller’s way of addressing McCarthyism, and the unjust communist trials. He choose Salem, a town where the Salem witch trials occurred, to run parallel with the communist trials. The setting of the play is in Salem Massachusetts, in 1692. A puritan society is living life day by day, night by night. This highly religious community is very isolated, and rely on each other amongst themselves to survive. Though this, it can create turmoil, and individual rivalries are born. With already so much tension between neighbours over aspects such as wealth and religion, any significant event could trigger these already tense rivalries. The trigger soon became reality, when a group of young girls prayed to spirits in the woods. They are found by the local minister, and a young girl faints and falls into a trance. Due to belief in witchcraft, the hysteria has begun, and is fuelled by the individual rivalries, and their own selfish desires. The girls claimed they were forced by the devil, and other people within the village. Thus, parallel to the communist trials, the witch trials begin. The main characters of the book are fellow neighbours who have their own thoughts on the hysteria, and have their own stand for or against it. Abigail Williams, a servant of Reverend Parris, has social power among the other servants, and was quite involved in the spiritual praying among the woods. She is in love with a man named John Proctor, who is already married, and seeks his love. She uses the trials to help aid her desire for John. John proctor is a good and well-respected man, but with one dark secret: his affair with Abigail. He knows the trials are a hoax, all pretense, and is determined to stop and denounce the young girls, especially Abigail. Elizabeth Proctor, wife of John Proctor, is a quiet wife, who stays at home for the majority of day. She has her suspicions of John and Abigail, and due to this, there is tension between the couple. Reverend Hale is a respected minister, who is called upon by Parris to seek evidence of witchcraft among Salem. But his authority and opinion is soon ignored, as the girls’ credibility and trust rises. In the trials, the girls are called upon in court to accuse people who they “saw” with the devil. Anybody who was convicted had no real way of escape, and where forced to confess, or be hanged. Those who confessed were only sentenced to minimal jail time. Within the hysteria, the girls are looked at as holy individuals, the “eyes of god”. The accusers are looked at as pure and devout Christians, which is accurately shown in a quote by John proctor. Soon enough, Abigail sees the power she has, and, to win back John, stabs herself and accuses Elizabeth. This in turn, infuriates John, as he and his good neighbours Giles Corey and Francis nurse interrupt the court to denounce Abigail. The Crucible is written in third person omniscient, as the character’s actions, thoughts and feelings are shown in the stage directions beside the dialogue. To add to that, the author has provided readers a introduction to the character, prior to their first appearance, to explain the background and personality of said character. This helps the reader to understand the character’s desires and motives to their actions. A bit of background information: The Crucible is an allegory of the communist trials in 1957, where senator McCarthy proclaimed to possess a list of the names of 205 people in the US State Department who were members of the American Communist Party. Many of these names were from Hollywood, and like the trials, the people who were accused were forced to confess. The individuals who were accused lost their jobs, family, friends and were alienated from society. Similar to the witch trials, people who were accused in Salem lost their reputation, and a tainted good name. Miller wrote The Crucible as an act of desperation against all the hysteria at the time. He was afraid of the injustice within the trials, and how people accused others they despised, like in The Crucible. Another reason was because the two periods were so similar to each other, Miller wanted to show what could happen to American societies through The Crucible. And one of the most significant motives to The Crucible, is John Proctor. Arthur Miller is portrayed by John Proctor, and Miller wants to the readers to feel empathy for him. Both men were accused by people in the trials (Miller in the communist trials), and both refused to give the names of others who were also associated with them. So in a way, when the reader feels empathy to John Proctor, they also feel empathy towards Miller himself. 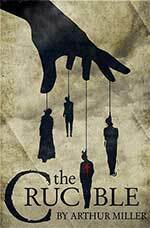 The ending to The Crucible shows who the characters truly are, as emotions are sure to flow through the reader in the final pages. Intense and full of moments of intrigue, an emotional ending to a great play. A great story reflecting the times of 2 periods, with rich character development and symbolism. This book is recommended to high school students, as it is written in a seventeenth-century English, with Shakespearean like vocabulary. Not only that, to understand the symbols and to fully understand the themes of the play take great concentration and an understanding of even the communist trials. A play that surely will stir emotions, and to help them with a better understanding of not only Salem, but Arthur Miller himself and the Communist trials. Admin on Book Buddies Needed! Rashad Moussa on Book Buddies Needed! lpieczonka on Join Teen Advisory Group for 2014/2015 School Year!